After a quick breakfast we got on the bus to the Zambezi Swing site. We spent the day doing a variety of activities, beginning with a 30m abseil (rappel) into a canyon. Next we used the same toprope to rap-jump into the canyon. Rap jumping is like rappelling except that the rope is attached at your back and you are face forward. Next was the flying fox. A dual cable is stretched across the canyon. There is a pulley on the cable with a rope hanging from it. 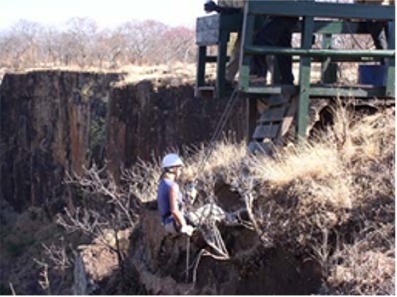 The jumper is connected into a harness at the back and runs down a ramp, jumping into the canyon. Momentum and gravity carries you most of the way across the canyon and you are pulled back by a rope. The last activity was the Zambezi Swing itself. Again a cable is stretched across the canyon and a group of climbing ropes is attached to the cable in the center. The jumper stands on the rim of the canyon and is attached to a climbing harness. Jumping into the canyon gives you about a 50m freefall before the rope arrests you, swinging you like a pendulum back and forth across the canyon. Once you slow down enough, you are lowered down to the canyon floor to hike back up. The morning consisted of an introduction to all these activities. The swing was the most frightening, requiring you to step off the edge of the canyon into a freefall. Everyone there that day managed to actually jump. After lunch we were free to do any of the activities we wanted. Jen and I did the flying fox a couple more times. We decided to do a tandem swing (both of us attached to the rope and jumping at the same time.) We got to the edge, but fear and the knowledge that we’d already done it got the better of us and we backed out. We spent the rest of the afternoon enjoying views over the canyon and having beers. Woke to poor weather. We decided to make our way back to Cape Town, stopping at Byerskloof vinyard on the way. Byerskloof is a small operation, unlike Distel. They had no tour, but had an excellent shop with all of their wines available for tasting. They also had products made with their wine like salami. Good stuff! Once back in Cape Town we looked up Byron Herbert. We had met Byron in Maun where he was touring with the Cape Land Rover Club. He offered to let us stay at his house in Camps Bay, which was very nice. The town of Camps Bay is one of the trendiest places around Cape Town, and has a great beachfront with excellent restaurants. Byron’s house has a guest wing where he let us stay. For that, we took him out to dinner at the Codfather and had fantastic sushi, calamari and cape salmon. Today was the day of our re-scheduled rafting trip. After breakfast we piled into a big 4x4 truck and drove to the put-in at Rapid 10. The drive was bone jarring over bad road. The hike to the put in was very steep down log ladders into the roughly 500 foot deep canyon. Jerrod was our guide, a young guy from Canada. We had a group of six, Jen and I, Corby, a lady who works for the peace corps in Malawi, and a couple of girls off an overland truck. The Zambezi has a legendary reputation as the largest commercially run river in the world. The volume is huge, about 800 cubic meters per second which translates to about 25-30k cfs. The volume is currently too high to take clients down the upper part of the river (rapids 1-10) so we missed the biggest water the river has to offer. It was still very exciting and we did get to see the curling wave on Rapid 11. 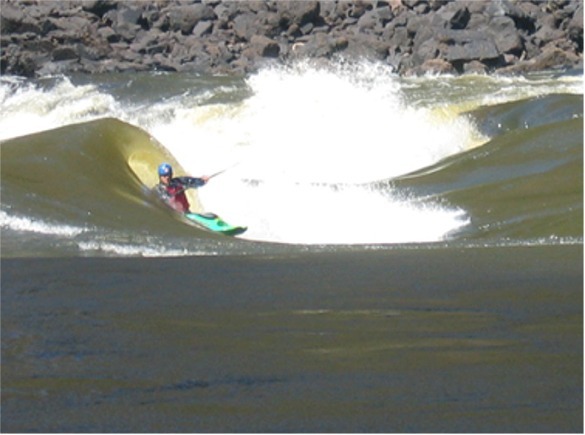 The river is very non-technical, it’s just a matter of going straight through huge wave trains. The water is deep and the rapids are separated by pools of flat water. There was a lot of paddling during day, and the poor state of the access roads and the long hikes in and out meant that we were off the river by 2pm. There is a cable car under construction at the take out, but apparently poor design and workmanship have killed the project. After another bone-jarring truck ride we returned to the campground where we were given dinner (at 330) and watched the video they took during the day. That evening we spent time talking with Helen and Tony over beers on the deck. We took a tour around the Cape today. 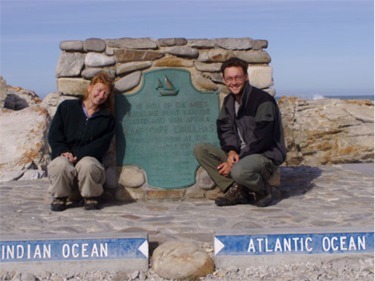 Our plan was to go down to the Cape Point, but the Cape of Good Hope park is quite expensive to get into, and in the end we decided to skip it. 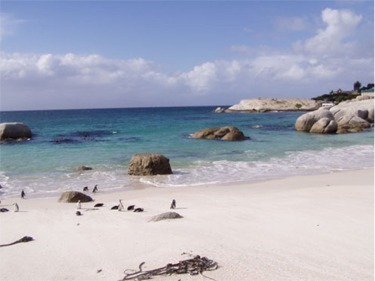 Instead we made our way to Boulders Beach to see the penguin colony. The area has been made into a National Park, and has a very nice boardwalk down to the beach so that you can observe the penguins without disturbing them too much. In the parking area at Boulders we were subjected to intense questioning from a group of American tourists who found it hard to believe we had driven all the way from England. We had lunch at a restaurant in Kommetjie and then headed back into town. Byron had told us of a Land Rover specialist, and Graham wanted to pick up some parts. After some searching we found LR, and bought brake pads, a timing belt and a steering box rebuild kit. The steering box in the Land Rover was getting pretty bad, now leaking fluid, and Graham though that having that rebuild kit handy was a good idea. We then continued on to Century City where we had a lousy dinner at a fast food curry place. We saw Hidalgo at the movie theatre after than and then went back to Camps Bay. We drove into town this morning to use the internet and try to set up a day of kayaking for Witt. Jen spent the morning in the internet café while I went with Ollie, who will be my guide on the river tomorrow. We found a Necky Gliss that I fit into, but just barely. We took the boat and the rest of my gear to Fawlty Towers backpackers where Emma let me use their pool for a little roll practice. I spent about 30 minutes in the pool doing rolls and trying to get the feel of the boat. The fit isn’t great, but I can paddle it for a day. In the afternoon we went to Victoria Falls, the main attraction of the area. We walked across the footbridge in front of the falls and got soaked by the spray. 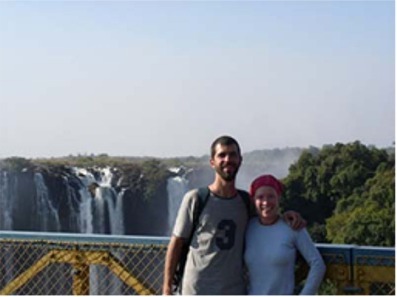 Vic Falls is incredible because it drops into a deep gorge, and tourists can walk out to the opposite side of the gorge providing an awesome view of the falls. There were multiple rainbows and the sound of millions of liters of water tumbling into the gorge was amazing. We noticed Helen and Tony’s Landcruiser in the parking lot and went to watch them do the bungi jump off the automobile bridge over the river, just downstream of the falls. Watching them jump was good fun, and we were tempted to do it ourselves. We went to the Royal Livingstone hotel (a five star resort) for sundowners on their deck. It was all very civilized except for the vervet monkey that jumped onto our table and stole half our peanuts! After dark we walked back to the falls (the hotel has a private entrance to the park) to see the falls by the full moon. As amazing as the falls are by day they are even more impressive by the light of the moon. The water disappears into a dense mist of spray and a rainbow cast by moonlight arcs over the canyon. The scene looks like something out of a Tolkein novel. Spent our last day in Cape Town getting things finished up. We went to the V&A Waterfront again where Graham completed some web updates and sent them off. Connie did some shopping, but didn’t spend any money. In the evening we took Byron out for dinner again. He recommended the Chapman’s Peak Hotel which is supposed to have the best calamari in Cape Town and it was quite excellent! We woke early this morning so that Jen could drop me at Fawlty Towers to meet Ollie for another day on the river. We left at about 830 and after another trip down the horrible road to the put-in (this time a little less jarring in a Land Rover) we hired some porters to carry our boats down. Our group consisted of myself, Peter and Tim who are here from Australia just to boat, and Peter’s sister Sarah who will be in a tandem kayak with the guide. Almost as soon as I got on the river I realized that the water was harder than I thought. The eddie lines are 3 boat lengths long and full of turbulent, boiling water. There are lots of whirlpools and upwellings. The lines through the rapids are not technical, just straight down the middle. The water is huge and more pushy than anything I’ve ever even contemplated. I ended out swimming at least half the rapids and had a very tough and exhausting day. Peter and Tim got to practice their rescue skills, chasing me and my boat around the river all day. I hit a couple of combat rolls, missed a few more, and by the time the water started getting easier toward the bottom of the run I was too tired to paddle aggressively. The day definitely falls into the category of “Anything that doesn’t kill you makes you stronger.” Fortunately for me the river is safe despite it’s size. There are pools below every rapid and there are no exposed rocks and few sticky holes. After the driver dropped me at the campground Jen and I had dinner and I was asleep by 8pm. We were awoken at about 10 by some partying overland truck passengers who had set up their tent in our camp site. I wasn’t in a mood to be nice and told them off, which prompted them to move their tent. Note that the photos below were taken by Pete and are not all from the day I was with them. Got up late and left Byron’s house. We were planning on waiting to meet his family but they didn’t return from the airport before we felt we had to leave. It’s a pity, because Byron was very nice to us and very helpful. 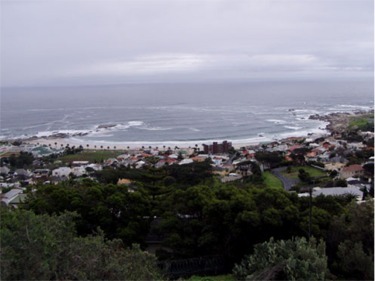 Making our way out of Cape Town, we choose the scenic route along the coast. 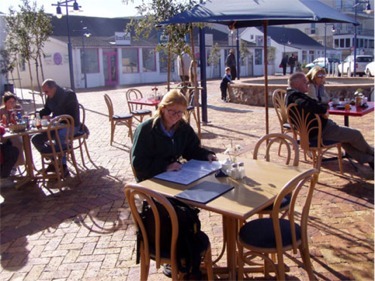 At Hermanus we stopped for coffee, and sat on the bay watching the wright whales come in. We also saw a group of dassies on the shore which was nice because they were a lot closer than the ones we saw in the Karoo National Park. By evening we made it to Arniston, and we stopped at a backpacker place right next to a military base. We had sandwiches in the room and went to bed. Hoping to be able finally to leave Livingstone tomorrow, we spent the day grocery shopping and stocking up on supplies for the next leg of our trip. We stopped at Fawlty Towers to leave some money to pay for the kayak trip. Emma said that they still felt bad for the thing with our car and wanted to buy us some drinks. We agreed to meet her this evening, despite our better judgment (drinking with these people seems to always involve LOTS of alcohol.) We went back to the falls in the afternoon and hiked down to the boiling pot. The spot provides a great view of the bridge and we watched a couple of bungi jumpers as the mist from the falls drifted past in the canyon. We did some souvenir shopping at the stalls near the park entrance, and then went to a new campground to try to avoid the overland trucks at the Zambezi Waterfront. We ran into Jeff and Jane, a british couple who have come down the east coast in a Landcruiser. We talked with them for a couple of hours before driving into town to meet with Emma, Nick, Fiona, and some other friends. We went to a local restaurant for dinner, then came back to Hippos for drinks. We had a good conversation with Emma and her boyfriend Aubrey who flies helicopters and aircraft for a tour company. They invited us to a housewarming party tomorrow night, and Emma even offered us a free room at Fawlty Towers. We couldn’t turn down their hospitality and accepted their offer. If we don’t leave soon, though, I’m concerned that we’ll have to look for jobs here! The first order of business was to go to Cape Aguhlas, the Southernmost tip of Africa. It was a very pleasant drive down there, and we stopped at a coffee shop just before the light house for breakfast. Unlike Cape Point you don’t have to pay to visit Cape Aguhlas. We spent some time down by the marker taking pictures. Then Connie went about collecting shells and rocks. We then toured the light house museum which is in the light house and has an excellent display of some of the most famous light houses in the world and all of the light houses in Southern Africa. We left the cape just after lunch and headed into the Garden Route proper. This is an area of South Africa with a lot of farming and some very spectacular scenery. We stopped for a late lunch at a farm stall and bought some excellent droewors. 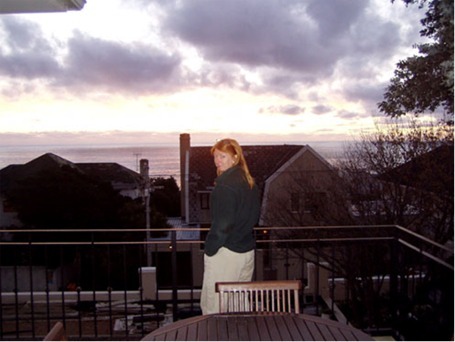 By evening we made it to Wilderness, and we stopped at the Beach House Backpackers. As you may expect from the name it is right on the beach, and we enjoyed a spectacular sunset by the fire. We camped in the parking lot overlooking the beach and the railway.